If I had to name five items that are obligatory in my baking repertoire, after The Big Four (sugar, butter, flour, and eggs), a bottle of kirsch is essential for me, right up there with vanilla, vying for numéro 5. A few drops of kirsch highlights and augments the flavor of peaches, nectarines, plums, and every kind of berry imaginable. And since it’s summer and all those fruits are ever-present in my kitchen, my slender bottle of kirsch hasn’t been returned to its perch on the liquor shelf since the first strawberries arrived a month ago. 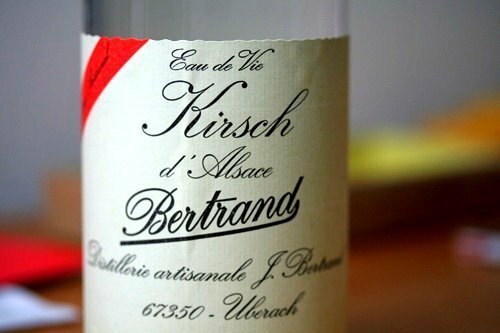 A good bottle of kirsch runs about $40 (750ml) in the United States, although smaller bottles are less expensive. Why is it so darned pricey? Because it takes about 20-30 pounds of fruit to make a bottle of kirsch (also called kirschwasser). So even though I think I got a D- in high school math, it doesn’t take an honor student to calculate that 20 or 30 pounds of cherries, at let’s say…I dunno, $2/pound, makes that bottle suddenly seems like not such a bad deal after all. Depending on who’s making it, kirsch can be made with sweet or sour cherries, and often the pits get crushed along with the fruit, adding a slight bitter almond-like edge. But unless you’re feeding a capacity crowd, or have a heavy hand, a bottle should last you at least a decade (mine is over five years old and it’s still 2/3rd full), and it doesn’t lose much of its flavor over time. For those on a budget, plum or pear eau-de-vie are similar and can be used, but aren’t quite the same thing. But unless you want it to be the predominant flavor, a few drops (around 1/2 teaspoon) of kirsch is usually all that’s necessary to spill into a big bowl of fresh sugared berries, a pot of just-cooked jam, dripped into a purée destined for an icy fruit sorbet, or mixed with apricots or peaches ready to be baked into a warm crisp or cobbler. In spite of its high-test alcohol scent, the flavor is fairly subtle unless you add a lot. Which I never really do, since I use it as an accent rather than letting it dominate. So even if you can’t exactly taste it, why do I use it? I once told Harold McGee that I liked to use a few drops of vanilla extract along with vanilla beans because I thought that the beans alone didn’t provide the same flavor I was looking for. And he said sensory studies were done that showed that alcohol, even if it’s cooked off, increases the way we perceive and enjoy flavors. So the small amount of kirsch, while seemingly insignificant, likely does the same thing. I don’t normally call for expensive ingredients in recipes, but think that kirsch is so vital to my pastry larder that I can’t help it and often have to tag on the word “optional” on when I’d really like to say it’s “obligatory.” But I think that once you try it, you’ll find it just as essential as I do. So why not give it a shot? Check your local liquor or spirits store when shopping for kirsch. 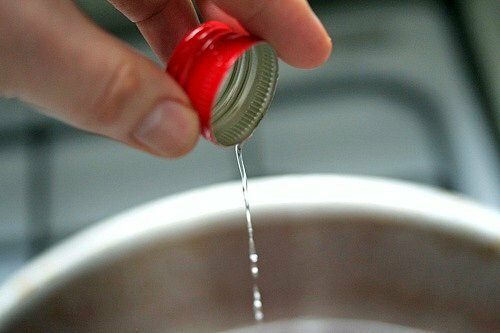 Most well-stocked ones carry at good brand and a 350ml bottle should be plenty for most home cooks. I would be wary of buying a bottle of kirsch that’s inexpensive as it’s not likely to be very good. I don’t normally recommend shopping by price, but in this case, because of what goes in to making quality eaux-de-vie, you get what you pay for. Ask at a liquor shop with a knowledgeable sales staff for advice. Interesting, didn’t know about kirsch… And the bit about alcohol increasing the way we perceive flavor. Thanks for sharing! Bethany: I was trying to find the article that he was talking about online, to link to it, but I couldn’t. Still, I do think he’s right and that’s why I always add a bit of vanilla extract even if using beans. A small dash of kirsch really does augment flavors tremendously and it’s definitely something to stock in one’s pantry. That’s really interesting about alcohol increasing perception of flavour. I have Kirsch in the cupboard, will try it with strawberries soon. I’m a keen jam maker and I’m loving the idea of a little Kirsch in some strawberry jam, will try that as well. As a side, I had your new book pre-ordered months ago, and was trying to keep it to take on holiday, but I didn’t last (!). Fabulous read, and as soon as I saw the recipe for dulce de leche brownies – had to make them. Seriously awesome! We had them straight, then with a little cream and strawberries for dessert. The best both ways, thank you! As I recall even cheese fondue recipes suggest to add a little Kirsch……..I never used it since it was OPTIONAL. but now I will definitely try it! Yeh, fantastic book! I’ve bought 2 more copies to friends so we could read it simultaneously while on separate vacations!! Somewhere along all of my reading cookbooks and such, I remember reading that there are a number of different flavor elements in everything we cook….some are released with heat, some are released with water, and still others are released by alcohol — thus adding a splash of wine/beer/kirsch unlocks those additional flavor elements. It makes sense — and things I cook with a little alcohol always have a deeper flavor than things cooked without. Also — you add kirsch to fondue because it keeps the proteins in the cheese from forming long links — the strings that form from your pizza are a result of the long protein chains in the mozzarella when it’s heated. Try making fondue some time with kirsch and without it — with kirsch, you’ll have a velvety smooth dip — without it, the protein chains will tighten, and you’ll end up with a knotted mass floating in a pool of fat that the proteins have squeezed out of the cheese. Yuk. On second thought, just add the kirsch. Can’t remember where I read the first one — the second enlightenment comes courtesy of Alton Brown’s show that airs on Food Network in the US — it’s called Good Eats, and is a pinnacle of geek meets eats. Great recipes, with a lot of science as to WHY your recipe works the way it does — it’s the only TV program I miss! Maybe because Kirsch was a fairly expensive ingredient back when growing up in Austria, my mother always used a teaspoon of Austrian Stroh Rum in her baking. Though a totally different flavor, it had the same effect of bringing forward a whole additional dimension of aroma. We’ve had a bottle of homemade Kirschwasser for over a decade and I never knew what to do with it (aside from occasional shots!) Now I know!! I’ll give it a try with the next batch of your strawberry-rhubarb sorbet I make! I know what you mean about vanilla beans vs. extract. Leave it to McGee et al to confirm it through science! A bit of kirsch does wonders for summer pudding. Thanks for the interesting info – I look forward to using kirsch as a subtle flavoring rather than a traditional liqueur, in which capacity I’ve always found it a bit icky. I can get behind the idea of using it to highlight other flavors. I would spend that just for the bottle alone. What a beautiful label. What an informative post! I have Kirsch sitting in my liquor cabinet, but the only thing I’ve ever used it for is fondue. That will change immediately! Love the look of those griottes! I’m experimenting with making griotte vinegar at the moment, and they are also surprisingly delicious in clafoutis (with a splash of kirsch!). Totally agree with you about kirsch. 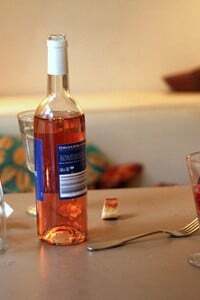 I always have a bottle if it, along with Chambord and Cointreau in the kitchen. My 3 secret weapons of dessert-making! Thanks for the great info! I visited Clear Creek Distillery a few months back for an article I was working on. What a tasting they provided! I bought a bottle of their kirschwasser for baking, but it was so yummy I couldn’t help but have a nip here and there. I haven’t used Kirsch in my fruit yet, (I recall using it in fondue though), and will purchase a bottle now. I believe Harold is probably right about a bit of alcohol in food increasing the satisfaction factor, even when it is cooked out. Along with, or instead of extracts, I often use alcohol in cooking and baking. Fairly recently I used Disaronno in a Marion berry pie, and The Macallan Scotch in a brown sugar shortbread. Although you can’t exactly detect the flavors, alcohol does something to food that makes it better somehow. I’m not just saying this because I used to work in a bar. Really. You believe me right lol? Harold McGee is a pretty interesting guy. It would be interesting to go to one of those crazy dinners with him. If you ever get the chance please blog about it. I know his work well, and unexpectedly got to enjoy a lecture with him recently. I’m one of those people who purchased a bottle of Kirsch for cheese fondue and had no idea what else to do with it. Big thanks from me to you. Wow, I wish that cherries were $2 a pound here in Maine – $2 a pound is the price here when they’re on sale. $4 a pound is the regular price. And we get them for only a few weeks a year, right now! Ev: I was just rounding if off. I would imagine they don’t pay quite that much since the cherries they used are probably ‘culls’ (imperfect ones). I did buy cherries this morning and paid €3.50/kg (2.2#), which was a deal since most of the others were around €5/kg, but they were extra-ripe so I had to eat them all today…no problem! But maybe we should do a trade for Maine blueberries. I’d kill for a few baskets of those..
I’d say you’ve done quite well for yourself David, even with that D- in math! :) I’ve stumbled upon several recipes that call for kirsch, might have to look into that soon. Have you had it in champagne? To me, Kirsch is the culinary equivalent of triple sec in the cocktail world. Sure, you can get by without either one, but use it and it takes things to a whole new level. I love them both! I totally agree! I’m temporarily living with family and my bottle of kirsch was one of baking supplies that I rescued from my house. This website is a sweet heaven.. yea. I am up early in the morning and going through this space in the dark. I will perhaps read more of your work later. Well, I’m not sure whether its the kirsch, but I’m in love with your nectarine sorbet I made over the weekend. And my new neigbors seemed very happy to receive a plate of your dulce de leche brownies. Of course, I couldn’t part with the whole batch and squirelled away a few to eat with your vanilla ice cream (the egg-custard version), which was the perfect ending to a wonderful meal of carnitas tacos (again, your recipe). You see, it was another “David” weekend at our house. Without your knowledge (until now), you’ve become quite the regular house-guest at our little bungalow in Fairfax, CA, and you are welcome anytime! On the issue of vanilla, we’ve been making our own vanilla extract (dead easy – just cold macerating 10 split beans in bottle of vodka for 3 – 6 months) and I agree with you completely about the flavour. We’ve come to the conclusion that you get more flavour from the extract than you do from scraping out the actual bean, possibly because the alcohol and time helps to drag those out of the pods. Scraping out vanilla beans and adding them to a dish has become a very in vogue technique used by lots of celebrity chefs, and I agree the little black dots really add character to a dish. 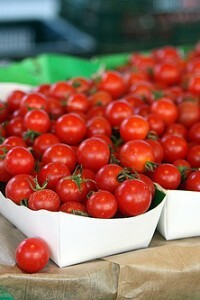 But when we want to add lots of flavour, we will definitely use the homemade extract as well. I had been wondering what Kirsch was. Thanks for the explanations and the links. My mom used to make cherry liquour every summer during cherry season. They would ferment in dark glass bottles on the balcony for a while before she did some of her magic with them. maybe it was her cheap version of kirsch. I’ll ask her in August when I fly to Albania. 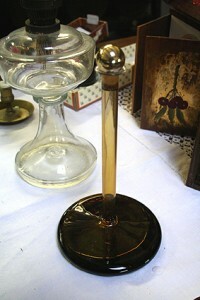 I often have kirsch and other eau-de-vies as a digestif after dinner. The Clear Creek distillery (your first link there) is local, and I love every single one of their liquors (and liqueurs!). Thanks for all of the cooking ideas for my favorite sipping alcohol! Along the same lines, I add a little Grand Marnier to my bowls of strawberries. And when I chocolate dip strawberries, I add a few drops of Grand Marnier to the chocolate. Oooh it is good! When I work with apples, I brighten up the flavor with Calvados, another of my favorites. I almost bought a bottle a couple of weeks ago when I was making one of your strawberry ice cream recipes and now I think you just convinced me! Okay. So… I read the post…. I check out the website for Clear Creek Distillery (I AM an Oregonian) and see this. Inspired by an obscure Alsatian distillate called Eau de Vie de Bourgeons de Sapin, Steve McCarthy worked on developing the perfect Oregon version of a tree spirit, an Eau de Vie of Douglas Fir, for ten years. This eau de vie is made from an infusion of the springtime buds of Douglas fir picked by hand into clear brandy which is then re-distilled and re-infused with more buds. Hmmm, I wonder what this could be used for? I bet DL would have an idea. Kirsch-the new Grand Marnier? I can’t wait to try it! Thanks for this wonderful, informative blog! Wish you’d posted this yesterday. Today I made 14 jars of sour cherry preserves –your recipe–but skipped the kirsch (even though I have it on hand) because my grandmother never used it. Tant pis! yes, love kirsch. my grandma in france would always add some to virtually all pastries. nice post. nice pictures. as always. thanks for reminding me of this wonderful liquor. Moldy & Cathy: Grand Marnier does almost the same thing, except it is sweetened and to me, the orange flavor is not always something I want in a bowl of berries or with peaches, or in a sorbet. Kirsch is more neutral. devlyn: Yes, it’s very special to have a place like that distillery nearby. And when you see how eau-de-vie is made, and what goes in to it, you realize why it costs what it does. And you really appreciate it more. It’s always been the final ingredient in my family’s fondue. We’ve used the same recipe for over 50 years, since my parents brought it home from Switzerland in the 1950’s. I never thought about adding it to anything else, though I did wonder why it was the “magic” at the end of this wonderful family favorite every Christmas Eve. After reading your post, I’ll start adding it to some other recipes where it might add just that note. That is very interesting about vanilla beans vs. extract. I must look into this Kirsch situation. OT: Yesterday I saw Petulia and she had a surprise for me, your book! I’m so excited. I wasn’t sure if I could find the book in Italy and was going to ask a friend traveling from the States to bring me a copy. Thank you for signing it! I cannot WAIT to read it. I have a long train ride coming up but don’t think I can hold out that long. ooops, I forgot the “s” in Kirsch. Jennie, The Douglas Fir Eau-de-Vie is amazing. The flavor is very citrus with a vaguely spearmint flavor. I think ice cream would be the first thing I made using it. But, frankly it is just too yummy, I think I’d drink it all first. This is a very informative post. I’m curious to learn more about adding it to jams. Does it matter at what point you add it during the cooking process? And does it affect the shelf life at all? I’ve recently entered the world of canning and have only made my grandma’s apricot jam recipe but am looking for ways to take it to the next level. Thanks!!! Allison: I add it just at the end, while it’s still warm, reasoning that if I added it during cooking, most of the flavor (which I like) would cook off. Just wanted to comment that along with Kirsch, Calvados is another one of those expensive liqueurs that I hesitate to buy, only because I don’t bake often enough AND I’m allergic to alcohol (i always have to cook it off). But, for now, until I can share a bottle with someone, I’ll take your word for it! Love your blog. From your photos to your recipes to your great writing-your blog always makes me smile and learn something, too. I’m so glad you included a link to the Bay Area’s own St. George Spirits. I took a tour there a few months ago and was treated to the amazing smell of something like 3 tons of pears, just waiting to be turned into something amazing. I’m happy to have a reason to buy another of their great products (and highly recommend the tour)! Thanks for the informative post. Todd has a bottle of Luxardo Maraschino Liqueur and it’s delicious, potent, but delicious. We’ll grab ourselves a bottle of the Kirsch and add that to our cocktail repertoire! Diane: Maraschino is quite good, too, and a good substitute for kirsch. (I think it’s less-expensive, too.) That’s a good brand. Can’t wait to have cocktails with you in your backyard! If you can find cherries for under $3.99, please tell me where. In the greater Boston area, that is a sale price at Stop and Shop. I have seen the really large “white” cherries on sale for that, but in a local farm market, Mike saw them for $6 and refused to buy. The dark red cherries typically go for the $3.99–and being correct instead of typical pricing nonsense–$4, are a treat. They were also a favorite of my maternal grandmother–and my grandparents had a tree in their yard as well. I can’t get enough. And mixing them with Kirsch could be real heaven. ( Mike’s grandfather used to mix homegrown raspberries with vodka and let it sit for eons–talk about a knock-out!!) I remember when you were on the Today show with Katie Couric and showed her cherry recipes and used a paper clip instead of a cherry pitter–whatever works in a pinch! This bit about how long a bottle will last presumes, of course, that you don’t drink it in addition to baking with it! Or Lantenhammer, or Reisetbauer (which makes some really bizarre things), or Ziegler (likewise). I have a rather old French cook book and have a dessert recipe for Negre un Chemise. made with egg yolks and covered with whipped cream. Have you ever tried the Hungarian apricot eau-de-vie, barac palinka? It’s fantastic for baking. I mix barac palinka with vanilla and almond extract and substitute the mixture for vanilla pain perdu and in chocolate recipes. Barac palinka is also an interesting addition to apricot glaze on a tart or a cake. I’ve made a lot of recipes from The Perfect Scoop and would have to say that it’s best not to think of Kirsch as optional. I just have DeKuyper brand, but it definitely adds a lot to fruit sorbets. I’ve tried the base before and after adding it, and the difference is dramatic. Leaving it out is kind of like skipping the vanilla in a cookie recipe. I even came up with my own sorbet recipe using it, but added “or peach schnapps, vodka” etc. just in case people didn’t have it (but I’m sure kirsch would be best). Maybe I’ll have to invest in one of the better brands sometime. I’ve also been meaning to get some Chartreuse to use in your mousse recipe from The Sweet Life in Paris. Frank: I haven’t tried that, but it sounds great. I know there are many countries that have their own distillations, specifically in Eastern Europe, and I wish I could try them all! ben & diane: Ditto on those brands! There’s so many interesting eaux de vie out there, aren’t there? Ben: I don’t like to make it optional, since as you said, it’s pretty important. But for folks avoiding alcohol, people ask me all the time if it’s listed in a recipe, if they have to use it. That DeKuyper kirsch is okay, but once you’re done with the bottle, check out a better brand-you won’t be disappointed. I was fortunate to get my hands on some fresh sour cherries (here in the bay area that’s almost unheard of) and made a cherry pie with them. Recalling this post about the kirsch and fruit, and another post elsewhere about leaving pits in cherries in Clafoutis for the slight almond flavoring they lend, I amalgamated the two, but with a twist. As I pitted the cherries, I put a Tbsp or two of Kirshwasser in the pit bowl. It took about 45 minutes to pit those little suckers and when I was done, I stirred them well and let them soak a while, then dumped the kirsch/pit juice into the cherries prep as my flavoring and soaked it there again for a while. It was incredibly good. I will never use almond extract again with fresh cherries and instead, use my kirsch pit-stop flavoring from now on! I’d have never even thought of it without you! Thanks so much! Oh, I’ll have to dig out that bottle kirsch from the back of the liquor cabinet. I’m sure I bought it to make trifle, but since we’ve gone gluten-free, I haven’t made trifle in some time. I’ve got a lot of seasonal fruit around now, so I’m sure I can come up with some gluten-free uses for kirsch. We just went foraging for wild plums and came home with 60lbs! I was hoping to start making jam this evening (for the first time), but after reading your info on kirsch, I may have to make a trip to the market first! Thank you! Love your recipes! My son signed me up to bake a cherry clafoutis for his french class. didn’t know what kirsch was until i found this web site. It sounds too expensive for me so i think i’ll just add some chambord (that was a gift) to it instead. should be good, right? What do you think about Luxardo kirsch? I really love those expensive Luxardo gourmet maraschino cherries that are sold in restaurant supply shops and specialty food stores. They are very dark in color and have an addictive and deep flavor. I like them particularly in financiers. Jars of Luxardo cherries are quite expensive, but I prefer using this in my baking over the cheap and usual brightly-colored maraschino cherries found in the supermarkets made with corn syrup. I ask about Luxardo kirsch because I am interested in creating my own version of Luxardo maraschino cherries at home using kirsch or something similar to rumtopf and was wondering not only what you thought of this brand or kirsch. but also if you had a recipe for preparing kirsch-soaked cherries. I’d like to make large batches of them to store them for later use or whenever I’d need them for baking/recipes (cakes, financiers, bars). How long would I have to preserve these cherries in the kirsch and how should they be stored? Luxardo is quite good. I don’t have a recipe on the site for those cherries but you can likely find one online. Nice selection, but also consider the Swiss brands, which is quite a few instances are less costly than the French. Remember Kirsch is originally a Swiss, Alsatian thing (ergo the German name). My old home was in the center of Kirsch country, a stone’s throw from one of the best known distilleries, no defunct. We picked the cherries for extra cash in the summer. 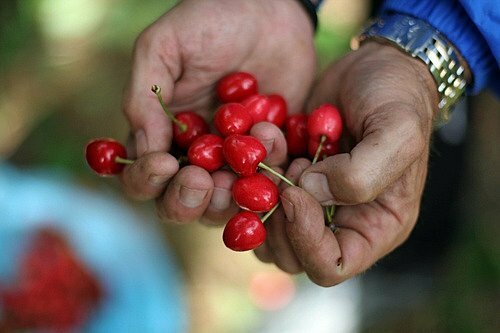 Interesting aside: All farmers in the northwest Schweiz with orchards take some of the cherries to a distiller for their own use. Each farmer is allowed two liters per cow tax free to wipe down the udders. Very little of that ever sees a barn. I have some. It burns with a pure blue flame. The really good stuff is over 100 proof and can drop a man in a couple of jiggers. The distillers are fussy. No stems or leaves can get into the mix, as they make the resulting liquor bitter. 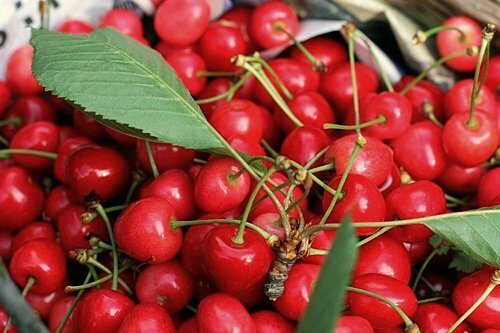 When city dwellers come out into the hills and grow cherries for hooch, they they take revenge on them by telling them to be sure to leave on stems and leaves. You get it. If you are ever around Nuglar or the area near Basel called Dornachberg in summer go out and see the cherry road. It’s breathtakingly beautiful with the hills alight with the blooms. I would say also that anything from Alsace will probably do. I sometimes use pruneaux or mirabelle instead, but they are by no means cheaper.